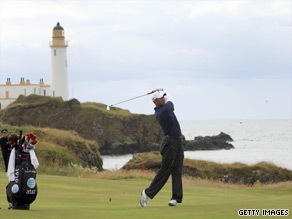 LONDON, England (CNN) -- The 138th British Open Golf Championship begins at the Scottish resort of Turnberry on Thursday with Tiger Woods spearheading the array of U.S. star players aiming to capture the world's oldest major. American hopes rest on Tiger Woods who had a closer look at the course during a practice round. The Americans face an uphill task for one of their number to take victory as world number two Phil Mickelson has already depleted the tourists' talent pool by withdrawing to be with his wife and mother as they both battle breast cancer. Consequently bookmakers' odds on another American taking victory are decidedly long, leaving Woods to carry much of the burden of expectation. But there is hope as the Turnberry course has proved a memorable one for U.S. golf fans with a clash between Jack Nicklaus and Tom Watson in 1977 in particular having captured the public imagination. Later dubbed the "Duel of the Sun," Watson overcame Nicklaus in a dramatic final round on a glorious day of summer sunshine at the course in one of the most thrilling finales in golf history. Subsequent wins ensured Watson is just one title behind Harry Vardon's record of six titles heading into what will be his penultimate British Open. Who do you think will win the British Open? Sound Off below. Indeed, it will be the fourth time that the demanding Ailsa Course at the Turnberry Resort is the venue for the Open having previously staged the event in 1986 and 1994, as well famously in 1977. Named after the third Marquess of Ailsa, who owned the land on which it was built, the par-70 7,211-yard course has had several famous landmarks which are recognizable to golf fans around the world. The ninth hole is probably the most well-known and is overlooked by the Turnberry lighthouse near the 13th-century ruins of Bruce's Castle, the reputed birthplace of Scotland's hero king Robert the Bruce. Nick Price was the winner when it was last held at Turnberry in 1994 and Greg Norman -- who went close in 2008 - also won there in 1986. But Ireland's Padraig Harrington will be the man to beat as he goes in search of his third consecutive title after he retained the Claret Jug at Royal Birkdale last year having won it at Carnoustie in 2007. The British Open was first staged at Prestwick Golf Club, in Ayrshire, Scotland in October 1860 with a field of just eight professional golfers and it has taken place every year on one of nine historic links courses in Scotland or England, with the exception of Northern Ireland in 1951. Along with the $1.2 million prize money the winner of the title also gets their hands on one of the most famous trophies in sport. The Golf Champion Trophy - known more commonly as the Claret Jug - dates from 1872, when a new trophy was needed after Young Tom Morris won the original prize of the Championship Belt outright in 1870 by winning the Open three years in a row. Although the original Claret Jug has been on permanent display at the clubhouse of the Royal and Ancient Golf Club of St Andrews and since Walter Hagen's victory in 1928 a replica has been presented to the winner. With all the history associated with Turnberry it promises to be an intriguing few days at the British Open. And with the American affinity for the event it would be churlish to rule out the potential of a winner from the U.S. - even if Woods fails to fire.